The United States Treasury Department announced today that the chief executive officers of several companies who received “bailout assistance” will have their pay for the 2012 year frozen at the 2011 levels – meaning that General Motors CEO Dan Akerson will not receive a raise this year. 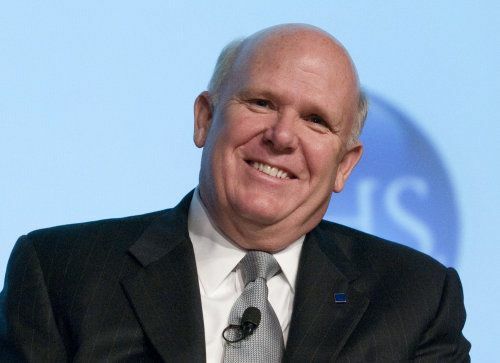 General Motors has not announced how much CEO Dan Akerson made in 2011 but Akerson has commented that he would not receive any bonuses for the 2011 year; shocking considering how well the once-struggling automaker did last year. In 2010, Akerson received $2.53 million in total compensation for the four months that he spent running GM so at that rate, the GM boss would be paid roughly $7.59 million but we won’t know exactly how much the auto exec made until GM decides to announce the numbers. In addition to General Motors, the pay freeze applies to two other companies who received massive loans under the Troubled Asset Relief Program (TARP), AIG and Ally Financial. Ally was formerly known as GMAC (the financing and banking division of General Motors) until that portion of the company was sold off as part of the bankruptcy steps preceding the bailout loans. Like Akerson, the current CEOs at these two financial firms will not receive any pay increase for the 2012 calendar year but considering that they probably all made millions of dollars – we would bet that they won’t have too much trouble making ends meet this year. According to Automotive News, Ally CEO Michael Carpenter made over $9.54 million in 2011 so with payment in that range for 2012, he shouldn’t be losing any sleep over his finances…although the majority of his compensation was in the form of stock awards so technically, he hasn’t made $10 million but he has that much worth in the company that he is running. In addition to the US Treasury Department freezing the pay of CEOs of General Motors, AIG and Ally Financial for 2012, the feds announced that 69 high ranking executives within those three companies will be receiving pay cuts of about 10% this year. Unfortunately for the 3 CEOs and the 69 other executives affected by the 2012 pay freeze/pay cut for bailout companies, there is nothing that they can do about these decisions until the US federal government is no longer in charge of the company. These cuts could have affected the Chrysler Group due to their involvement but lucky for those execs, Fiat bought them out and worked quickly to pay off the huge government loans as quickly as they could find other sources of financing. Supposing that Dan Akerson does make somewhere in the area of $7.5 million, that figure would make him among the lowest paid CEOs of a major automaker in the world. Even though Chrysler Group CEO hasn’t accepted any payment in the past two years for his work with the smallest of the Detroit Big 3, he received $19 million for his role atop Fiat SpA in 2011. On the other hand, Ford’s Alan Mulally ranked as the top paid automotive executive in the world with payment nearing $30 million in 2011 although $22 million of that was in the form of company stock. So much for the myth that GM "paid back its loans" and "isn't under the control of the government."